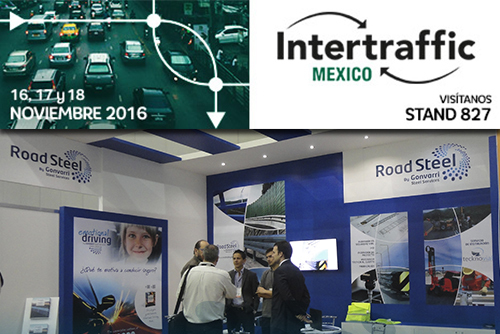 Road Steel, business line of Gonvarri Steel Services, took recently part in Intertraffic México, exhibition held in Ciudad de Mexico between the 16th and 18th of November. Road Steel attended the event aiming to make themselves known in the Aztec country and to show its ideas and solutions in the field of road safety infrastructures. Currently, Road Steel has a strong presence in the American continent with headquarters in Itagüí (Colombia) and Arizona (USA). Intertraffic is organised once every two years to ensure that the products shown at the exhibition are totally new. Innovation is the key word at Intertraffic. This exhibition is the place where almost 27,000 professional visitors and exhibitors meet, network and do business with each other. There are met from manufacturers and importers to local agents for products in the field of mobility solutions in the segments Smart Mobility, Infrastructure, Traffic Management, Safety and Parking.